It would be better if we could Select Best Server for Ubuntu Repositories to download packages faster as well as Select Best Server for Mint Repositories. These screen-shots are Mock-up of [Other Software]Tab on 'Software Sources' which be improved in my thoughts. For the present, to Select Best Server for Ubuntu Repositories, we need to edit Sources manually or need to use Ailurus which @Alexio mentioned in his comments. Ailurus does not work as it is on Katya. If you are interested in making Ailurus work on Katya, please refer a tutorial How to make 'Ailurus' work on Mint 11 Katya which I posted before. This idea has entirely rewritten as it based on the content of original idea (Version 1.0). sunewbie	 good idea. promoting it. If this improvement would be implemented, then I'll convert this to a tutorial. But I'm not sure it is possible or not that Software Sources also check and select the best server for '3rd party sources'. ussher	 This is a good idea. Changing the repos can make a huge difference in speed. With the current "Select Best Server" it does it for the main packages but leaves the default "3rd party sources" as their default. These should also be checked when selecting the best server. I will study English more hard! I hope Mint Team would think this idea is worthy to consider. By the way, I guess maybe @remoulder didn't understand what was I talking about, because my English was veeerrry poor when I posted first version of this idea. blueXrider	 It's a good idea to locate the fastest server or best server possible for the updates. 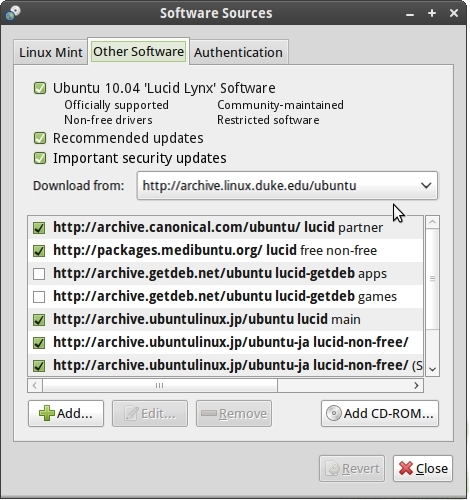 @remoulder I could only find PPA's or software sources that have Ubuntu listed. I could not find ANY with MINT. So where are the Mint Servers listed? kazztan0325	 I realized that some ideas are difficult for readers to understand its content without any screen-shot or rough sketch. I installed Ailurus, but it didn't run as it was. After a while, I found out the way of tweaking. Natty user (or Katya user) have to edit "/usr/share/pyshared/ailurus/lib.py", right? Anyway I am able to use Ailurus on Katya now. Thanks again for your info, @Alexio! kazztan0325	 @Alexio, Thank you for your information! Alexio	 @kazztan0325 - You can always try find the right package using the Linux Packages Search. The latest version of Ailurus is 10.10.3.1 and it may work with Ubuntu 11.04 and Linux Mint 11 after some tweaking. kazztan0325	 @Alexio, Thank you for your message. But sadly, It seems that there is not "Ailurus for Ubuntu 11.04 Natty (Mint 11 Katya)" yet. Alexio	 @kazztan0325 - You can install Ailurus and use it to find the fastest server for you. Also, you can enable some third party repositories with Ailurus. kazztan0325	 @remoulder, Sure Mint is not ubuntu. But Mint is compatible with ubuntu software repositories. 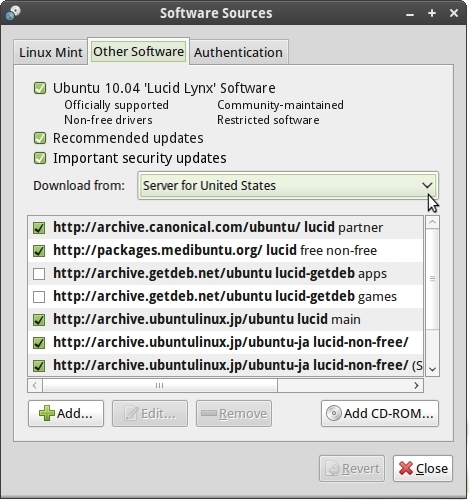 Many packages from ubuntu's repos are downloaded and installed in Mint. In my case, Local ubuntu server("ftp.jaist.ac.jp") is 5 ~ 10 times faster than default ubuntu server("canonical.ubuntu.com""security.ubuntu.com""updates.ubuntu.com"). 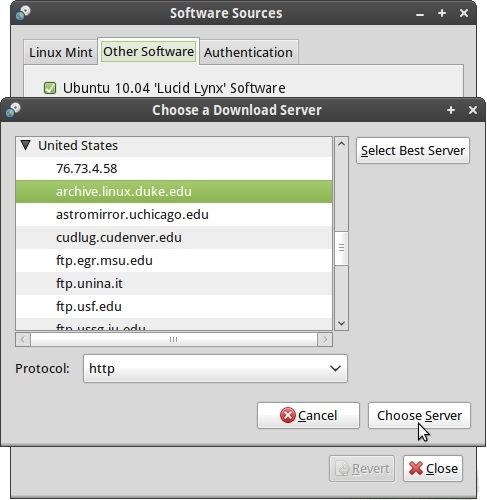 remoulder	 Mint is not ubuntu, selecting the best server searches for the best mint server.